Tiger Bill Reviews Funkifying the clave DVD by Robby Ameen and Lincoln Goines from Alfred Publishing. This DVD is a companion to the popular Alfred Publishing Book/CD of the same name dealing with traditional Afro-Cuban rhythms and their application to funk, rock, and jazz. It features bassist, author, composer, and music educator Lincoln Goines, well known for his work in the New York City Latin, jazz-funk, and studio scene. And drummer Robby Ameen, who has made a life-long study of Afro-Cuban rhythms. Also appearing on the DVD is Wayne Krantz on guitar and Bill O'Connell on keyboard. The DVD can be played in either English or Spanish. Let's check it out in detail. After a brief intro by bassist Lincoln Goines, the DVD is arranged into 9 main chapters as follows. Robby offers an explanation and demonstration of the various types of Clave patterns. Robby and Lincoln then demonstrate the Tumbao on bass and drums used in a variety of styles, tempos, and patterns. This section contains good examples of the use of the Clave and Tumbao in practical situations. Robby explains the typical Salsa song form and demonstrates its use playing with the rest of the band with on screen text clearly marking each section. The swing feel of the various Afro-Cuban patterns is covered well with Goines and Robby playing different feels normally used in Afro-Cuban styles. Lincoln and Robby jam on the Songo groove to demonstrate what types of variations can be done with it. Fast and slow tempo examples are included as well as funkified versions. Lincoln and Robby demonstrate the Guaguanco, which is one of the three forms of the Rhumba with Robby playing the Conga pattern against Lincoln playing the Clave on a block. Robby then applies the Guaguanco to the drumset. Robby and Lincoln play the traditional Guaguanco on their respective instruments. Then they play a New Orleans Second Line Groove and finally morph back and forth between that and the funkified Guaguanco. Basic 6/8 rhythms in demonstrated in a jam that moves between 6/8 and various other grooves including 4/4 jazz and 3/4 waltz patterns. Lincoln demonstrates the Slap bass technique used in a Cha-Cha-Cha. The quartet plays a blues while demonstrating what can be done with the Cha-Cha-Cha. Robby and Lincoln demonstrate the basics of the pattern that has been used by drummers from Steve Gadd to Elvin Jones. With the addition of Wayne Krantz, the power trio offers a demonstration of a "Metal Mozambique." Robby explains how many of these patterns are greatly modified and mixed within the context of the same song. Robby and Lincoln plays an original tune by Lincoln that features this concept of changing patterns. Again the changing patterns are marked with on screen text so you can clearly see when the changes are happening. This section includes new material consisting of five songs with bass and drums that was recorded live at the Drummer's Collective in NYC in 2006! 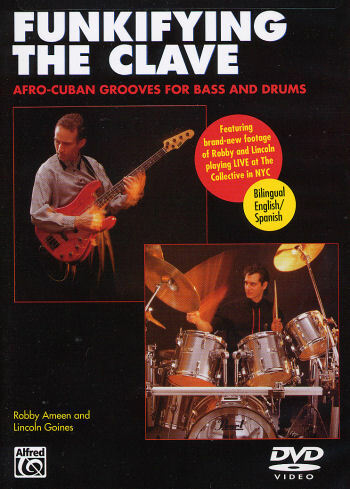 I highly recommend this DVD to drummers and bass players who want to start playing Afro-Cuban music on the right foot. It also contains valuable material for more experienced players who want to delve further into the intricacies of Afro-Cuban styles from the standpoint of drummer and bass player interaction. The combined experience of drummer Ameen and bassist Goines will help put you on the fast track to an incredibly rich, intricate, and rewarding style of music.